This page is for the original 1998 game. For the remaster, see Forsaken Remastered. Engine is open source with a modern multi-platform port available. 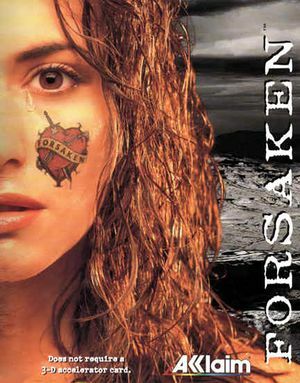 Community port of Forsaken, runs on cross-platform technologies and currently officially supports Windows, Linux, and OS X. Go to the disc and set Windows 95 compatibility mode for autorun.exe and setup.exe. Set Windows 95 compatibility mode for all the 3 executables FORSAKEN*.EXE in the installation folder. Download dgVoodoo 2 and extract D3DImm.dll and DDraw.dll to the installation folder (tested with v2.44). download and extract some custom graphic card opt files. Start FORSAKEN.EXE, select "512MB" as Renderer. After the game starts choose any resolution in the visual options. CD music will work if the disc is inserted in CD-ROM 0. If you don't mind playing with CDDA, using ProjectX as engine requires a much simpler installation. Add -fov:<number> command line argument. Replace <number> with desired FOV; default is 90, max is 120. This page was last edited on 13 August 2018, at 12:49.